What was I saying about those chickpeas not remaining lonely for long? Sundays are when I feel like something warm and comforting to curl up on the sofa with (you know, besides TheHusband...). While a light and springy tuna salad was perfect for yesterday, today the overcast sky demanded something with a bit more substance. Something like a stew or a soup or a fragrant curry. This is easy to make, using simple ingredients, but the result is so much more than the sum of its parts. You can adapt this easily to suit what you have on hand - leave out the paneer or add some potatoes. Delicious either way. 1. Cook spinach in a large saucepan with a little bit of water over medium heat for about 7 minutes until wilted. Leave to cool slightly and puree in a food processor. Set aside. 2. Meanwhile, heat the olive oil over medium heat and saute onion, garlic and ginger for a few minutes until onion is translucent. 3. Add the cumin, coriander and masala, fry for a few seconds until fragrant, then add the tomatoes, turn heat lower, cover and simmer for 20 - 30 minutes until liquid has reduced (remove lid for last few minutes if necessary). 4. Add salt, chickpeas and yogurt, crumble the paneer in and cook for another 5 minutes to combine the flavours. Serve with poppadums, rooties or basmati rice. Ons het ook gisteraand poppadums geëet saam met Rogan-Josh hoender. :-) Nogal 'n 'peculiur' smaak..
Dit is nogal 'n anderste smaak ja! Maar lekker vir afwisseling. Ek het 'n spicy een gekoop, sal volgende keer die plain koop en sien hoe dit smaak. Thanks Katie. 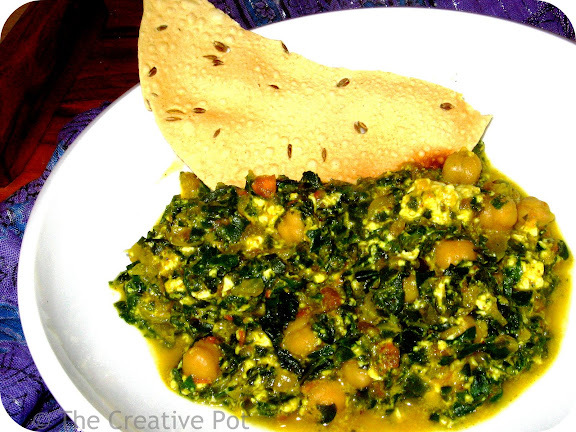 If you made it with potatoes, it would be called Palak Aloo. You should definitely try the paneer making again - it tastes amazing. The secret is not too fiddle with it too much - just scoop the curds into a muslin cloth and let it hang overnight in your window sill. In the morning, transfer the ball of cheese to the fridge and cover with clingwrap until ready to use. Nina posted how to make panneer, and now I have found the perfect recipe to use it in! Great for Meat free Monday again! I aim to please... ;-) This is so tasty I promise you won't even miss the meat. Yum! I recently discovered a little Indian grocery store two blocks from my house, so I'll be sure to make this soon. I love paneer. Paneer is the best isn't it?